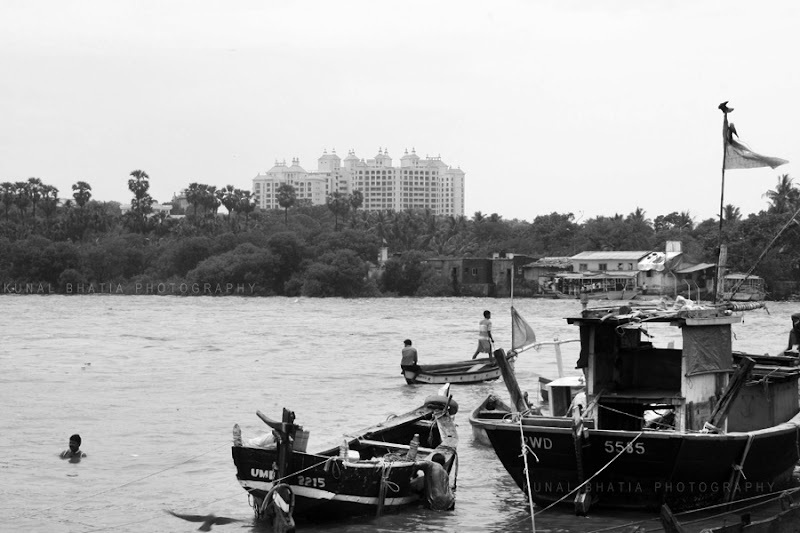 a luxurious housing complex in madh makes its presence felt, over coconut trees and fishing boats in the brackish waters of the malad creek. progress can't be stopped. i love this image. The tide is pretty high. Plus. Am not sure if that's progress. They are probably encroaching on mangroves. progress is a relative term. the building tops light up in the evening, like the distant palace of a feudal lord. Bombay does have such contrasting lifestyles, and yet each one has a sense of belonging. good judgement , the colored version of this photo must not have given such an impact like the mono one.